Reasonably-priced drinks, good food, and a comfortable atmosphere define a great neighborhood bar. Whether it’s in Fairfield or New Haven, you’ll find a plethora of these welcoming local haunts. From classic Irish pubs to cozy taverns, here are the 10 best neighborhood bars in Connecticut. Bill’s Crossroads Café is a friendly neighborhood bar that works to keep its prices low. Their menu, which changes frequently, features yummy bar food such as wings, pierogis, onion straws, and mac and cheese. Once you’ve got a full stomach, dive into their inexpensive no-frills drinks menu while playing a game of pool. Smokey O’Grady’s is a popular spot among younger residents of East Lyme and the surrounding towns. Smokey’s has a great selection of beers on tap as well as a full bar and good bar menu full of fried foods. The jalapeno poppers and mozzarella sticks are perfectly greasy snacks to go with a drink. In the summer, they also open up an outdoor patio, which extends the space, making room for more mingling. A mix between neighborhood bar and trendy tavern, Tautog is great for locavores with a craving for bar food. The menu at Tautog Tavern is created mostly from local-sourced ingredients but the meals are entirely stick-to-your ribs. Dishes include wings, deviled eggs, fried pickles, sliders, burgers, and more. Drinks available include cocktails, beers, and wine and a variety of drinks are discounted during happy hour. This hopping Irish bar is locally appreciated as much for its food as it is its drinks. The menu features flavorful Irish and American dishes such as corned beef and cabbage, meatloaf, and their crowd-pleasing mac and cheese. Inishmor also offers 26 draft beers including local brews. 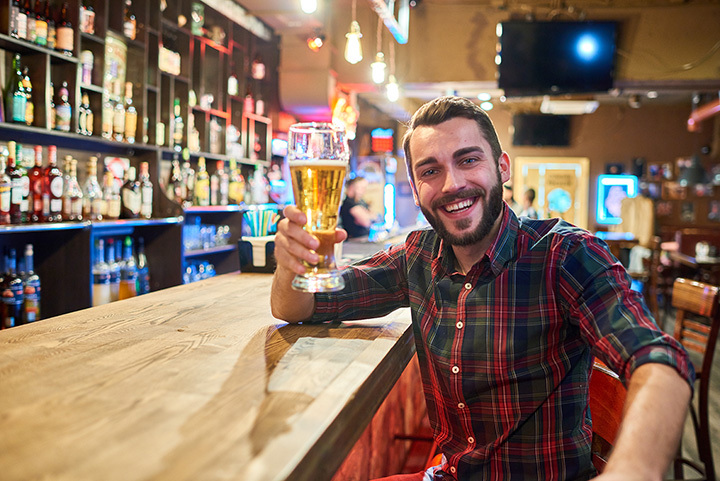 Beers change frequently to allow customers to find new favorites. Families with children are also welcome to dine at Inishmor during the earlier hours. Casey’s Tavern features great lunch, dinner, and drink menus. Expect to find sausage rolls, fried mozzarella, potato soup, burgers, and corned beef. Drinks include beer, mixed drinks, and more and numerous specials are on offer throughout the month. They also have space for private parties, with room for a band, if you’re looking to celebrate a birthday or reunion. Hot Rod’s is locally known and loved for its casual atmosphere, great location, and award-winning wings. Popular with both students and young professionals Hot Rod’s has a whopping 24 beers on tap, a tasty menu, and ample seating both indoors and out. Hot Rod Café also hosts frequent events and recognizes hardworking locals each month. Voted one of the best places for wings in CT, we also love Dew Drop Inn for their casual, historical atmosphere and great beer selection. This well-established bar serves up flavorful wings with numerous sauces, nachos, sweet potato wedges, salads, sandwiches, steaks, and burgers. Wash your meal or apps down with 16-ounce drafts of Bronx Crystal Whipped IPA or Lexington Kentucky Vanilla Barrel Cream Ale. If you’re craving pizza and a beer, Colony Grill is the neighborhood bar that’s got you covered. Home of the hot oil pizza, this establishment has a selection of quality beers, such as Blue Moon, New England Brewing Co., and Allagash White, on tap and available in pitchers. They also have a selection of wines available by the glass or the bottle. Find locations in Stamford, Norwalk, Fairfield, and Milford. Stop by for Tuesday Night Trivia and stay for a homemade meal and a pint of beer. Bar 140’s frequently changing menu sometimes includes quesadillas, wings, crab cakes, mussels, soup, and more and they also hold a weekend brunch. The tap selection also changes as frequently as the menu, but often features a mix of craft brews and well-established favorites. Bar 140 also has an outdoor patio, expanding the relatively small space. Spigot Café has frequent discounted specials, making it a more affordable option even if you are drinking craft beers. On tap, Spigot Café offers a total of 18 beers, seven of them local, and more than 100 types of bottled beer as well as a huge selection whiskeys, ryes, and bourbons. View more Connecticut Bars and Saloons.